The sixth Asia Entrepreneurship Award (AEA) 2017 competition took place from October 25th to 27th, 2017 at the KOIL facilities on the University of Tokyo Kashiwa-no-ha Campus (located in Chiba Prefecture’s Kashiwa “Smart City”) northeast of the Japanese capital. 21 technology startups from 15 countries/regions mainly in Asia participated in the three-day event. Claro Energy from India, which avails a solar irrigation system for agriculture, won this year’s top award, while Singaporean image software firm ViSenze was runner-up as well as Audience Prize winner and engineering solutions provider Webgears WGT of Russia － offering Smart City programs － came in for the third-place finish. 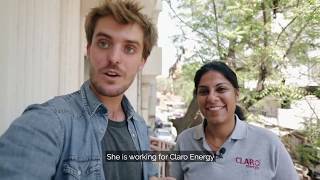 Claro Energy was established in early 2011 with the goal of disrupting the farm irrigation sector first on the Indian subcontinent, then around the rest of the world. Claro’s solar irrigation solutions to farmers should replace expensive Diesel engines/pumps. Besides being expensive Diesel-based pumps pollute extensively and use additional carbon footprint in the supply chains. Their intellectual property enables revectoring of horizontal solar solutions such as solar grids. Over the past six years they have deployed over 7,000 solar irrigation pumps across 15 states in India. They are also driving a lot of business model innovation in this space. Kartik Wahi, Co-founder and Director, made the presentation on behalf of Claro Energy. ViSenze powers visual commerce at scale for retailers and image recognition for enterprises. Major shopping sites like the Japanese Rakuten Ichiba (ViSenze has Japan’s Rakuten as a corporate mainstayer too), the British ASOS and Adidas, the globally-renowned German sportswear brand site, also use ViSenze to convert any UGC content into immediate product search opportunities, uplifting conversion rates. Spun-off from the National University of Singapore in 2012 by web entrepreneurs and computer vision scientists, the company’s mission is to simplify the way people search and discover the visual world. ViSenze is venture-backed by WI Harper in addition to aforementioned Rakuten, and officially supported by MasterCard. CEO and Co-founder Oliver Tan gave his firm’s final pitch. Webgears is a software technology company focusing on novel web-based three-dimensional (3D) graphics for industrial applications, plus for gaming use. Their product is a graphics engine, which lets the clients extract significantly more value from 3D models as well as interactive 3D graphics by almost eliminating hardware requirements and moving interactive 3D content to the cloud. The Russian outfit has been working closely with Dassault Systèmes of France, a global leader in the 3D field. These days coming to be well-recognized by the WGT brand mark among those in-the-know in the industry, Webgear is expanding its activities overseas, for example involving Smart City endeavors in Southeast Asia. According to CEO Larisa Dydykina who presented the Webgears pitch, they have just opened a new U.S. office in California where her son is located to further push business globally. This award competition has been held annually since 2012 aiming to realize an Asian ecosystem that generates innovation through collaborations of industry, government and academia. It has since then gathered together many young entrepreneurs from Asia not to mention from Oceania, in order to expand human networks through mentorship, discussion and mutual interaction. With the particular focus this year being on support for business collaboration between technology startups and locally-rooted companies, AEA has for over half a dozen years been offering various schemes where the startups surroundings in each country and recent trends thereto can be studied in depth, not to mention learning more about the background of successful ecosystems. As to the new Kashiwa-no-ha prize, established this year for a technology, product or service which could be useful in developing the Kashiwa-no-ha Campus as a smart city, this award was won by Genome Clinic of Japan, which as the name suggests is involved in genome medicine. In addition to the AEA 2017 prizes above,& Thai startup AIM GLOBAL INNOVATION obtained the NanoCarrier Prize, named after one of the leading supporters of the competition; AIM produces cute robots for training of autistic children. Further to support given by locally-headquartered bioventure NanoCarrier (TSE:4571) and others, kudos are due to real estate developer Mitsui Fudosan (TSE:8801), the University of Tokyo& Division of University Corporate Relations, TX Entrepreneur Partners (an incorporated association) and The Japan Academic Society for Ventures and Entrepreneurs as the central backers (Co-Hosts) of AEA. As the driving force behind the “Kashiwa-no-ha” project, Mitsui Fudosan underscored the need to further push entrepreneurship for betterment of society.